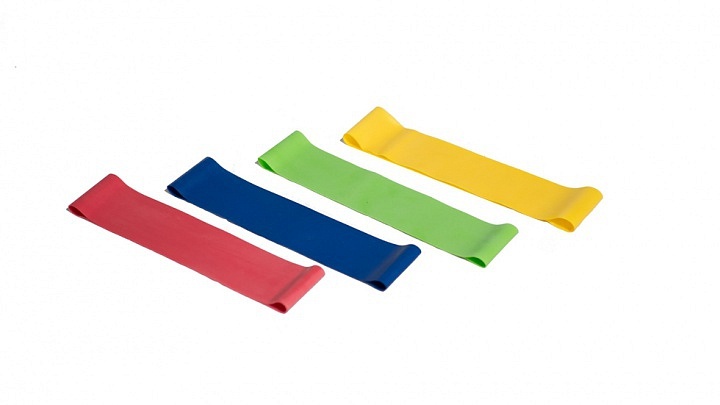 Mini bands are a portable, inexpensive and versatile piece of equipment that should be considered when programming athletic training regimens. Regardless of an athlete’s training experience, mini bands are easy to use, lightweight, easy to transport, and come in a variety of resistances. They can be incorporated in any part of an athlete’s day. In many instances, they are used to warm up, stimulate and recruit specific muscle groupings. They can also be used during a workout to increase resistance during body weight exercises, decrease spinal compression during lower-body exercises, and counteract and correct muscular imbalances. Increasing Resistances During Body Weight Exercises. When programming a training routine, variety and progression of exercise are needed to continually challenge athletes, especially when the program is being designed for those with years of resistance training experience. The dead bug exercise, for example, is a body weight exercise used to improve core stabilization and reduce low back pain. It is designed to encourage increased posterior pelvic tilt while simultaneously enhancing motor control.13 Because it can be performed with body weight and/or mini bands, adding a mini band is an easy way to increase resistance throughout the movement. This challenges the athlete to progress to the changes in intensity, leading to physiological improvements in the core musculature. The bear crawl is another effective body weight exercise that targets the core, shoulders, scapulae, and anterior serratus.4 The bear crawl is an important exercise because it challenges athletes to work from a quadruped position, unlike many traditional core exercises that are performed in a supine position. Bear crawls can assist in building anterior core strength, stability, coordination, and mobility4. 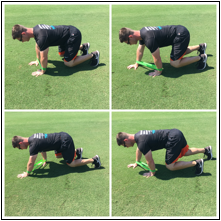 Body weight progressions can be performed crawling forward or backwards with or without pauses between each repetition. Adding a mini band increases the external load on the athlete, and challenges the shoulders and core musculature to progress to changes in intensity. Decreasing Spinal Compression. As the season progresses, the rigors of weight training, practice and game-play affect the ability of the body, including its muscles and central nervous system, to recover fully9. Additionally, poor posture while traveling for prolonged periods of time sitting on a bus or plane increases compression on the intervertebral disks and the vertebra, especially in the lumbar region8, 14. The combination of a fatigued central nervous system along with spinal compression, places athletes at a higher level of risk for injuries. Research published in the American Journal of Orthopedics has shown that back and core injuries make-up approximately 12% of all injuries that result in time out of play in MLB. In addition, other MLB reports from 2002 – 2008 have shown a staggering 359 days on the disabled list due to back and core injuries8. 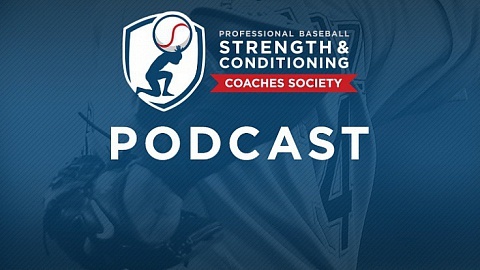 When designing a strength and conditioning program, a number of factors must be considered. One of special importance is reducing spinal compression. As many strength and conditioning professionals know, the barbell back squat is an effective exercise that externally loads the spine and is performed within many athletic programs. The barbell back squat effectively targets the entire lower body musculature and connective tissue, as well as, the trunk stabilizer muscles1. A traditional barbell squat is performed with a 45-pound barbell placed across the back of an athlete’s shoulders, loaded with weight on either side. The athlete starts from a standing position with the chest upright and feet slightly outside of the hips. From this position, the hips hinge backwards in a slow controlled manner. Keeping a slight bend in the knees, the athlete lowers the hips down into the bottom of the squat position. From the bottom position, the athlete returns to the standing position and repeat these movements for the desired number of repetitions. A good rule of thumb when squatting is that the shoulders, knees and toes, should all be in a line, parallel with one another at the bottom of the barbell back squat. As the season progresses, a time arrives where the risk of low-back injuries begins to outweigh the reward of increasing strength. When this occurs, mini bands can be used to help reduce compression of the low back and lumbar spine. An alternative method that can be used to modify the traditional squat is to place one mini band around the top of the knees and another around and above the ankles. 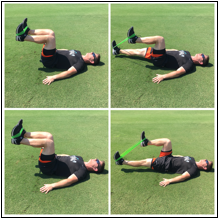 The bands will add external resistance and load on the legs by forcing the hips into an internally rotated position and force the ankles into an inverted position. 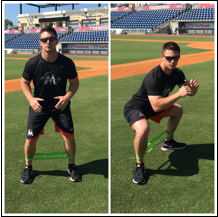 Using mini bands this way will target and recruit the glutes, increase the height of the arches of the feet, decrease the load placed on the spine, and provide a more stable an effective squatting position for the athlete15. Mini band walks and transverse plane squats can also be used to help decrease spinal compression and stimulate a variety of lower body muscles similar to the traditional barbell back squat. 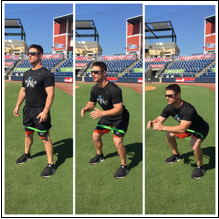 Mini band walks can be performed forward, backwards, and side-to-side to target and engage the glutes, hip flexors, abductors, and adductors15. The transverse plane squat targets the same muscles that most squat variations target, however, the external rotators of the moving leg and the adductors of the plant leg are stimulated more throughout the range of motion7. Mini bands can be used in a variety of ways to provide external resistance, improve strength, decrease spinal compression, enhance performance and help improve recovery. III. Correcting Imbalances. 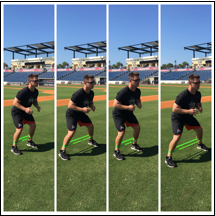 Throughout his career an athlete will perform physical movement assessments designed to help strength and conditioning professionals gain in-depth insight into his type and quality of movement. Knowing how an athlete moves can help a coach identify and correct muscular imbalances and faulty movement patterns. Inefficient movement patterning can cause reduced performance and is indicative of increased risk of injury12. One muscular group known for muscular imbalances and faulty movement patterning is the gluteal complex10, 11. The functions of the glutes include extension, abduction, anterior and posterior pelvic tilt, external rotation, and internal rotation of the hip joint. The muscles included are the gluteus maximus, gluteus medius, and gluteus minimus3. The gluteus maximus is the largest muscle in the body, whether measured by weight, cross-sectional area or volume2. 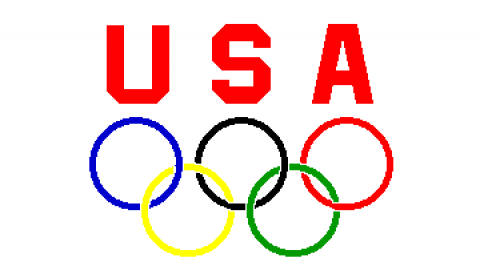 Humans appear to be symmetrical to the naked eye, however, many muscular asymmetries exist, especially in athletes. These muscular asymmetries, mixed with general inactivity are two causes of many of the gluteal imbalances observed during movement assessments2. It is common for athletes to be dominate on one-side of the body, causing a greater predisposition for an asymmetrical imbalance to occur, whether swinging a bat or throwing or kicking a ball. These asymmetrical imbalances can be corrected through a variety of methods including soft tissue work, massage, and specific corrective exercises5, 11, 12. Research has shown that athletes participating in sports with a multitude of landing impacts have the best gluteal development, implying that a large range of joint actions and loading types, in multiple planes of motion, are required for developing this muscle fully2, 11. Another reason for gluteal imbalances is general inactivity. Sitting for prolonged periods of time on a bus, plane, bench or at a locker puts the glutes in an inactive position. This inactivity can inhibit muscular recruitment of the glutes, causing the glutes to fail to contract properly. Research indicates that sitting for prolonged periods of time shortens the hip flexors, which decreases glute activation and can lead to other problems such as low back and hamstring pain. Furthermore, gluteal inhibition has cyclic negative effects on the body. gluteal inhibition negatively impacts posture and poor posture further inhibits the glutes. Over time, this can lead to inefficient movement and increase the risk of injury2, 10, 11. Two exercises that can be used to improve posture, alleviate low back pain, and strengthen the gluteal group are the glute bridge and the clam shell. The glute bridge is performed in the supine position with a mini-band placed around the top of the knees targeting the gluteus maximus. This exercise helps reduce low back pain by correcting excessive anterior pelvic tilt of the lumbar spine6, 10. The clam shell is performed in the side-lying position with a mini-band placed around the top of the knees. 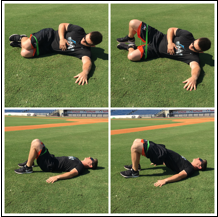 This movement targets the hip abductors, specifically the gluteus medius and helps prevent and reduce back pain by stimulating and encouraging the hip abductors to contract and fire more efficiently15. In conclusion, mini bands can be used in a variety of exercises and movement protocols within an athlete’s training regimen to help prolong an athlete’s health, athleticism, and career by counteracting imbalances, increasing resistance, and reducing external loads placed on the body. 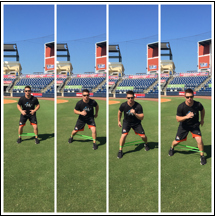 Rob Reichert, CSCS, RSCC, is a minor league strength and conditioning coach for the Miami Marlins. OlderHow Do I Know If My Son Has Good Pitching Mechanics?